Sometimes irony is one of life's highest delights. Other times it is a dagger, stabbing deadly barbs. Here's a story with irony. It's about finding gifts I didn't expect to find, and finding out that something else I thought was a gift turns out to be something else. It was morning and I was reading in my Bible. I'm slowly reading through the book of St. Matthew and am just about to the place where Jesus gets killed. In chapter 26, he's at someone's house for dinner and an unexpected guest crashes the party - a woman. She walks in to Jesus, bends down over him, kneels, breaks a bottle of expensive perfumed oil and pours it over his head. You may have heard or read the story. This woman's deed struck me when I started to think about it. I realized that if I had been sitting there, it would never have occurred to me to pour a flask of oil over his head. In fact, nothing at all would have occurred to me. I'd just be sitting there, maybe involved in a conversation with someone, enjoying the food for sure, and shocked when this woman walks in and does this crazy thing. I would agree with the disciples, who said it was crazy. Yes, she was crazy. She just wasted a fortune on this man when she could have sold the bottle and given the money to the poor. And why is she so hung up on him anyway? What's going on between them? So I asked myself why she did such an outlandish thing. The answer that came to me was, "Because she experienced something huge from Jesus, she was enormously touched and changed by him, and she wanted to express her love and appreciation in this way. It had to be something extravagant, because he did something extravagant for her." It never occurred to me to do anything big for Jesus. Why not? Why am I not inclined to give something precious of mine to God? That answer came right away. Because I haven't received anything big from Jesus, a.k.a God - at least, not in a very long time. I asked myself and God why that was so. Because I'm not open to the gifts Jesus is offering me, was the answer I heard in my mind's ear. That stung, but rang true. I am an idealistic person with definite ideas about how life should be. I've always seen that as one of my very best traits. If you're ever in doubt about a moral question, ask me. I'll probably have thought about it and have an answer. And I'll try and live accordingly. In school, idealism was held in high esteem. It was even an American virtue. I can hear the principal giving a speech right now, saluting "our wonderful, idealistic group of kids graduating this year, who will go out into the world and do great things." I fell for that hook, line and sinker. I wanted to go out there and do great things. I heard it at least as much in church. "My Utmost for His Highest" was one of the books lying around our house. It took me decades to find out that idealism isn't always good. It can also be a cause of suffering and a hindrance to being open for something else. I sat there in my bed, where I usually sit when I read and meditate. I let these thoughts sink into me. When life doesn't turn out the way I expect it to, I'm disappointed. I'm not really all that good at accepting life as it comes. Not that anyone is, really. It's hard to be disappointed about something and not let it throw you into a funk. Recently someone close to me let me down. This person doesn't walk the talk - one of the things in life that make my blood boil. I'm a firm believer in consistency. Why can't people see when they aren't living what they say they believe in? I was letting thoughts about that drift through my head that morning as I sat, meditating. Several examples came to mind of where I don't see the blessing around me because I'm upset about something else. I didn't mind if my thoughts made me look less than nice. I already know that I'm not really all that nice. I'm so glad to have discovered God's grace, mercy and forgiveness for myself. So I sat there, letting the thoughts drift. Our upcoming wedding anniversary floated past. A telephone conversation I'd had with my brother idled by. He was talking about a barbecued pork dish he'd heard about in a TV show with Steven Raichlen, the barbecue pope. Turns out the recipe comes from Germany. We had speculated just where this town might be. My husband Peter had identified the place, and I had checked it online. Thoughts continued to drift. Suddenly they consolidated, and everything joined into one gigantic realization. The conversation with my brother was a gift, and his interest in food one of his treasures! I've also expected other things from my brother that he hasn't been able to deliver on. But I hadn't truly recognized or truly received this special gift. He has blessed my tummy many, many times. Now he's off in America and I'm here in Germany, but he has blessed me again with the name of a town where we can get fantastic barbecued meat. 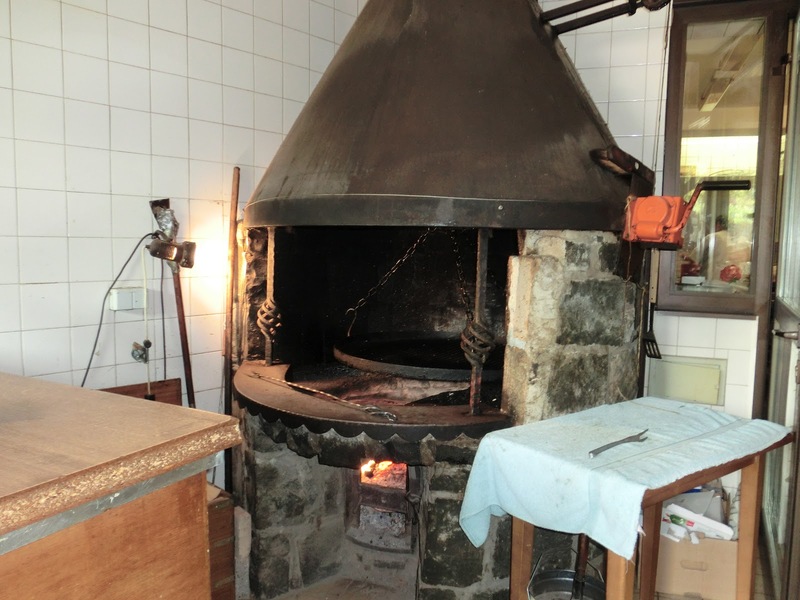 Steven Raichlen even goes so far as to say that the German barbecue cuisine is one of Europe's best-kept secrets. I certainly never knew that. In fact, I have been avoiding all the bratwurst and marinated pork chops I see in the supermarket, grilling hamburgers, steaks and teriyaki chicken instead. Now I hear that one of the best places in the world for barbecued food is Germany! So, in that instant I KNEW that Peter and I would be driving to Idar-Oberstein, the home of this great recipe, and trying out this famous dish, called Spiessbraten. And sure enough, he agreed to my idea, even though it involved a two and a half hour drive. Each way. Idar-Oberstein, you see, is in the middle of nowhere. You have to drive an entire hour once you get off the autobahn, just to get there. It's a sleepy little town, hidden in a river valley. I'd been to the Idar part of the town, but never to Oberstein. We went there once with our son when he was little, collecting rocks, and into geodes. All I saw there in Idar was a bunch of dusty semi-precious stones sitting on shelves in a museum. Idar-Oberstein is known for its semi-precious stones that used to be mined in the hills above. Years ago they stopped mining there, but stones are still polished and made into jewelry there. As we drove, we contempated the fact that this remote town contains so much of value. This town is not very well-known in Germany. Not valued. The country I live in is also not particularly beloved in the English-speaking world. It's still known as the country that welcomed Hitler into power, the country where some citizens committed unthinkable atrocities less than a hundred years ago. But a Jewish chef from Florida is praising their barbecue cuisine. He's even praising their pork. And I've been missing out on treasures. 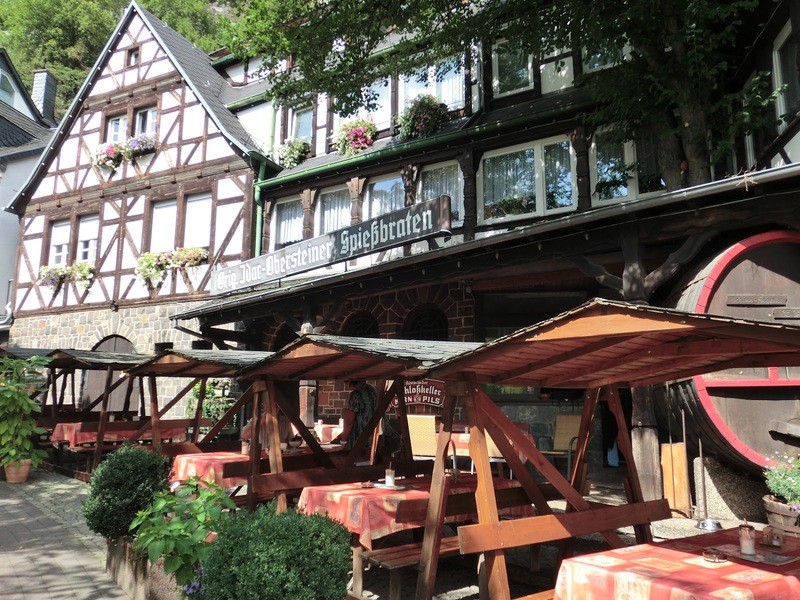 When we arrived in Oberstein, we found a really pretty town filled with cute half-timbered houses. There was a high hill above us with a church built right into the rock. And high above that, off to the left, a castle, partly in ruins. 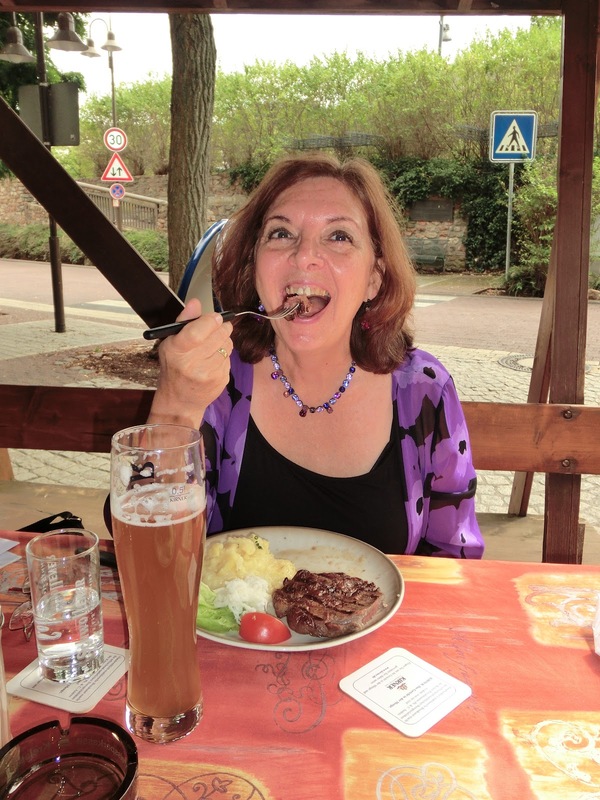 We had no difficulty finding a restaurant serving spiessbraten - there were restaurants all over advertising this dish. We sat down at a table at the nearest one, Schlossschenke, a hotel with a restaurant and outdoor café. It looked so inviting, with its wood beams, stones, and flowers in the windows. Flags were gently waving in the street opposite the restaurant, among them an American one. The menu was in English and German. Turns out this place isn't such a secret after all, at least among the American soldiers stationed in nearby Baumholder. Our waitress told us that many soldiers find their way to their restaurant, asking for spiessbraten. Spiessbraten as it is prepared in Idar-Oberstein can be either pork or beef. I ordered beef rumpsteak, and Peter pork. The important thing about it is that the meat is coated in a mixture of sliced onions, salt and pepper which you kind of knead around the meat every once in a while for about twelve hours, then grill on this special kind of grill you can turn around like a wheel as the meat cooks over beech wood. And you eat it with a white radish salad and some form of potatoes. We had potato salad, made in this region with oil and vinegar. It was indeed delicious and perhaps one of the best grilled meals we have ever eaten. We sat there, like a king and queen in a castle garden, enjoying a gem of a food we learned about from my brother in America. How I would love to be able to take him there to the place where the food he told me about originates. But I can't. He's not here, even though he gave us this gift. 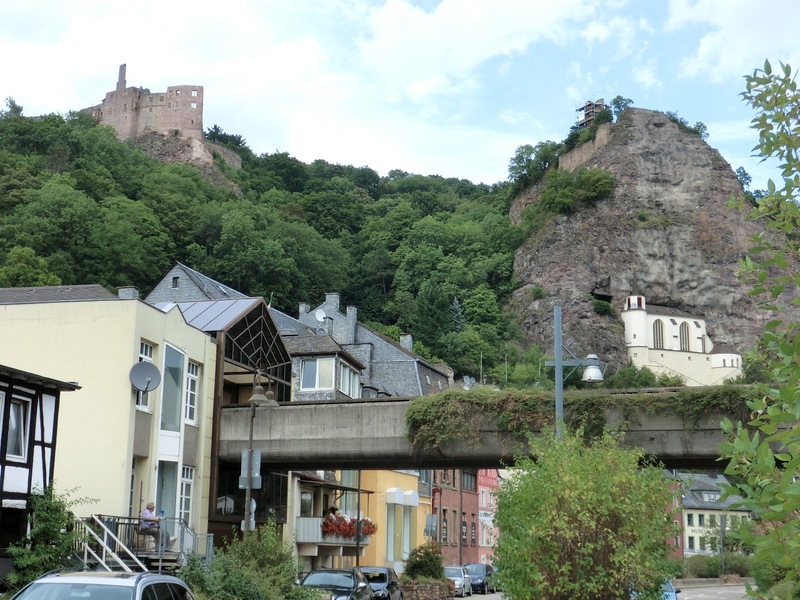 Ironically, he was once in Idar-Oberstein with his ex-wife when they came to Germany for Peter's and my wedding. But they didn't know about spiessbraten then. The waitress patiently explained how we could recreate the experience at home. We would need wood chips from a beech tree, but we could buy the wood at a nearby store. After finishing our meal, we walked through the town a little. I bought a turquoise necklace and some presents. We admired the church in the rock and castle in the distance. We stopped at a store on our way home to buy beech wood, but they were out of it. As soon as we got home, I phoned my brother to tell him about the experience. He was pleased to be such an important part of our wedding anniversary. Later in the week, I found wood chips at a local lumber store. We bought pork shoulder steak at our butcher's, and on Sunday we ate spiessbraten we made ourselves. If possible, it was even better than what we'd had in the restaurant. I am learning to recognize some of the treasures around me, opening myself up to the realization that I am being blessed all the time by my God. How good to be able to realize that, discovering that treasures are flowing through the floodgates! On that same weekend I was able to give a bit back to God. I played Bach's "Jesu, Joy of Man's Desiring" on the organ at a wedding last weekend. I played it as a gift to God. This is what they call worship.